To kick the 2016-2017 bow season off, we are having an in-house deer rodeo. This bow hunting competition will be held October 25th, 2016 - February 10th, 2017. The rodeo will consist of 2 person teams. 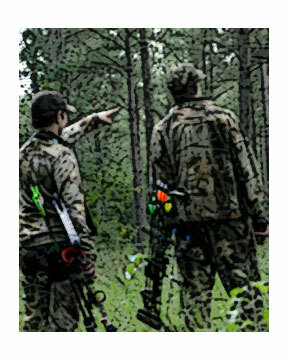 To enter the contest it will be an additional $125.00 per person added to your 2 or 3 day hunting package. See pricing here. Each team will be able to harvest 2 bucks, 8 points or better, 2 does per day, unlimited hogs, coyote, bobcats and fox. Each team will only be able to score their largest doe, buck, hog and predator. The scoring will be done by the measurements of the rack and weight of their harvests. We will have a total at the end of your hunt which will be posted on our facebook page. The winning teams will be announced at the end of deer season. There will be a 10 team minimum for this contest. If you book multiple hunts, you will be allowed to enter at the time of each booking. So come on! If you are you looking for great, low cost deer hunting in Alabama, but more fun than the rest, this is it! We offer bow hunting in Alabama with perks!! Let's have some fun!!! Call and book your hunt today! The only thing we skimp on is the price! Just wait until you see Black Creek Plantation of Alabama for yourself! To get your team signed up, call Pitts Lowman today at 334-304-5086. For more information about bow hunting at Black Creek Plantation of Alabama click here.